You’ve found the perfect place to rent, and now the property manager tells you all you need to do is fill out an application, so she can run a credit check—gulp. Whether you’ve got great credit, bad credit, or no credit, credit checks probably make you a little uneasy. What if there’s a problem? To help you feel more at ease, we are going to answer some common questions about landlord credit checks, preparing yourself for one, and your options if your credit isn’t stellar. Can a Landlord Really Check My Credit? Yes, landlords and property managers can legally screen you as a potential renter, and the screening process often involves a credit check. However, you must give your permission in writing. Your signature on the rental application may count as written permission, or you may be asked to sign a separate credit screening document. Landlord Associations will supply tenant credit checks to the landlords for a fee. Depending on the association, the credit check may show up on your credit report as a hard inquiry which may cause a slightly negative drop in your credit score. Tenant Screening Services may also provide credit reports to landlords. However, some of these organizations may not. Some reports the landlord can request may also include any prior evictions, bankruptcies, or judgments, and any other background information they require prior to offering tenancy. Credit Bureaus also provide the landlords with the credit reports, however, these services that are offered by Experian, TransUnion, and Equifax are usually shown as a soft inquiry on your credit report, and they require you to initiate the credit check yourself. What’s Included in a Rental Credit Check? Some landlords may also check your public bank and legal records and even dig into your social media profiles to uncover anything they’d consider unacceptable. “People don’t realize there is a full tenant screening. It’s beyond (a standard credit report) in most cases, particularly in the case of a large rental company,” says Rod Griffin, director of public education for Experian. The format of these reports depends on the company supplying them, but in terms of credit information, a report should generally contain the same credit details you would see if you ordered your own credit report. Who Pays for a Landlord Credit Check? With a rental application, you’ll most likely pay for the credit check. The check is usually included in the application fee. Concerned about paying that fee when you’re not sure you’ll be approved? You may not have a choice, but if you do, consider the DIY credit check strategies below. What if There’s a Problem with My Credit Report? Many landlords consider credit one of the most important parts of making a leasing decision. What credit score is needed to rent a house can differ from landlord to landlord, but you can expect the minimum to be somewhere between 600 and 620. Other things that matter to most landlords besides credit include income, criminal history, and eviction history. If a landlord uses information from a consumer report to take “adverse action” against you, they must give you the reason in writing and include information about how to order your own free credit report. In other words, if your report contains something negative that the landlord uses to make their decision, you’re entitled to know what this is, and you can request a free copy of your report. Adverse action can result in a denial of your application, but it can also include a requirement for a cosigner, a request for a larger deposit, or an increase of the monthly rent offer, according to the Federal Trade Commission (FTC). What can you do to ensure there are no surprises? Check your own credit in advance and tell the landlord about any potential problems that could be an issue. How Do I Check My Own Credit? Will you be renting a home or apartment in the not-too-distant future? Prepare yourself by getting your credit report in advance. An easy way is to sign up for two free credit scores from Credit.com. With your own credit report in hand, ask the property manager or landlord to review the report and see whether it’s worth it for you to apply. You can also ask them if they’ll let you use a service like Experian Connect to purchase a credit report that you can share with people you authorize. Equifax offers a similar service called Identity Report, and TransUnion’s service is called SmartMove. The landlord may still want a full tenant screening, but if you can provide your own credit report up-front, they can tell you whether you have a chance before you agree to lengthier—and possibly pricier—processing. Can I Rent if I Have Bad Credit? If you have bad credit, you might be wondering whether you can rent at all—but don’t worry! “Just because you have bad credit doesn’t mean you aren’t going to pay your rent on time,” says Matt Briggs, founder of RentTrack, a company that helps renters build their credit by paying through an online portal. Landlords know that renters usually don’t have perfect credit. Often the biggest concern is whether you pay your rent on time. Historically, information about rent hasn’t been included in standard credit reports and confirming on-time rent payments can be a tedious process of contacting former landlords. But recently, some rental payment history has started to appear on some credit reports, and companies like RentTrack can help people build credit through on-time, trackable payments. “Experian was the first company to include positive rent information in credit reports,” Griffin explains. Experian gathers this information from three companies: ClearNow, WilliamPaid, and RentTrack. When tenants pay rent using one of these online platforms, the payments get reported to Experian—and TransUnion also reports rental payments when available. However, note that you or your landlord have to sign up for one of these services for your rent payments to be included in your credit file. It’s also important to note that if you’ve had unpaid rental payments that were eventually turned over to a collection agency, the collection account will show up on your credit report. Accounts in collection can severely lower your credit score, making it more difficult to rent another place in the future. So be prepared to explain your situation if necessary and take steps to pay off those accounts to show that you’re committed to meeting financial responsibilities. Can I Rent with No Credit History? If you’re a student, a recent immigrant, or newly divorced, you may have a particularly hard time renting for the first time, especially if you haven’t established your own credit history. But if you can find a place, consider paying rent through a rental payment reporting company like RentTrack to build your credit. In the meantime, a landlord may rent to you—even if you have no credit—if you can find a cosigner with good credit. To increase your chances of approval, you could also offer to pay the first and last months’ rent or a higher security deposit. If none of those options work, consider looking for a cheaper place to rent where the landlord may have less strict credit requirements. Once you’re in, start building your credit. Pay down balances on your credit cards, make all payments on time, pay more than the minimum payments, and avoid carrying large balances on your accounts. If you feel that there is even the slightest chance you may not pass a rental credit check, there are a few things a potential tenant can do that will hopefully improve your chances. Find someone to co-sign for you so the landlord has a guarantee that they will get the rent payment, even if you were to default. Be completely honest and up front with the landlord about your finances and show them the progress you have made regarding paying your debt and rebuilding your credit. Landlords are always looking for that perfect tenant, so they have little to worry about especially when it comes to their rent being paid on time. Either as a potential tenant or a landlord, you should educate yourself and always be aware of different scams that may be going around. Federal Fair Housing Guidelines, as well as the standards of tenant screening, should always be followed and adhered to, and if there are any red flags, you should dig a little deeper for more information. It is best to find a landlord that is not long distance because this can certainly be a red flag for any tenant. If the landlord is not in the area, then typically they will use some kind of management company or other type of property managers to help oversee the properties. If this is not the case, you may want to be wary of a scam the landlord might be pulling on his tenants. Never go by an oral lease. Always have your lease in writing and retain the signed copy for your own records as well. 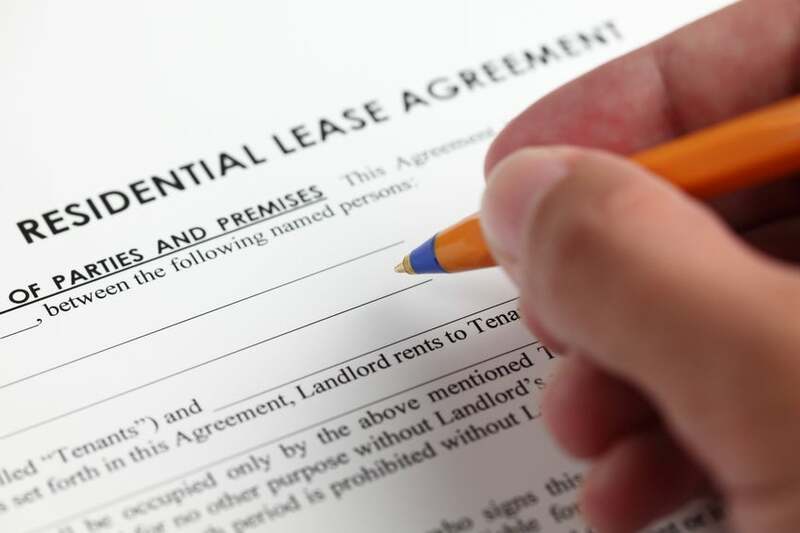 If the landlord is not willing to offer you a written lease, then this should be a red flag and may mean they will try to scam you out of money. Finally, if the landlord doesn’t have a tenant screening process in place as discussed above and does not utilize tenant screening services at all, then you may find that the landlord isn’t as high quality as you would expect. It may mean that they don’t care as much about the property or they may be running some kind of scam. Just like a landlord is always on the search for the quality prospective tenant by running tenant screening reports and checking credit reports; the tenant should also do their research on the type of landlord they are going to have as well. Can You Be Denied an Apartment Because of Bad Credit? Normally a creditor can’t require an individual who qualifies on their own to have their spouse cosign – assuming you do qualify on your income and credit alone. However, since your spouse will be living there with you it’s possible they can require the credit check on both of you. If you really want to live there you may want to just spring for it. (They may also be doing a more complete background check including evictions and/or criminal records.) But another option may be to ask the landlord if your spouse can pull his credit reports from AnnualCreditReport.com and share that with the landlord. Does each inquiry from the landlord affect my credit score? Yes, inquiries from landlords are hard inquiries. What will show up on my credit report if a potential landlord does a credit check? I have been in my apartment for a little less than a year now, with my boyfriend. We had both our mothers co sign on our lease just in case because we were running out of time before my current lease was up. I have looked at my credit reports and I’m just wondering if they even ran a credit check on me at all..
Hi Erin — If your landlord checked your full credit report, then his/her name or the name of their rental management company should appear on your credit report in the section on inquiries. That’s a common practice. I am not aware that it is illegal but you can research state landlord tenant laws to be sure. They probably won’t know but if you break your lease it can be expensive. And if you don’t pay it, you can be turned over to collections. Have you looked at your lease to find out what it will cost to break it? My daughter recently looked at a lower duplex and had to pay $40 for a background check to the potential landlord. Before filling out the application and turning it back in to him they found another place. She called that individual back and told them what happened and that she would return the application papers. Should she get her $40 back for a credit report that was never run by that landlord? She can ask for her money back but not sure how easy it will be for her to get it back. I imagine it would depend on whether it was a refundable application fee. Thanks for your response Gerri. The individual did contact her and set up a time to meet where she can then give him his blank app. back and he will refund her money. It was removed from his credit reports because of the limits on how long information can be reported on credit reports. That is different than the statute of limitations. In fact, by making a payment he likely extended the statute of limitations which gives the collection agency additional time to try to collect from him. (I can’t say for certain in his case, but that’s how it works in most states.) This article explains the difference between the two time periods: Does Your Old Debt Have an Expiration Date?. Unless he is sued for the remaining balance, though, it doesn’t sound like this debt should reappear on his credit reports. Also I assumed there is not already a court judgment against him. If there is a judgment then my advice above doesn’t apply because unpaid judgments can be reported for a very long time. My credit was checked by apartment leasing agent . It never showed up on my report. Is that normal? Did you check all three of your credit reports? If you only checked one of them it’s possible the credit check went through one of the other two. If there was an inquiry into your report with any of the three major agencies that inquiry must be listed on your credit report for two years. I checked equifax and transunion. My boyfriend and I filled out application. I filled in spouse section. Maybe they did a soft check on my credit? I doubt it but maybe it’s possible. I think they used experian because it did not show up on my boyfriends account either. You can get your free Experian report at AnnualCreditReport.com and a free score based on Experian data from Credit.com. Might not hurt to check! You’re welcome – let me know you find out. Curious now! I will, plan on checking online from laptop tomorrow. Prospected landlord wants me to get a credit check and fax it to her. Can I give her a copy of my free credit report or is what she is looking for different. Well she told me to do the credit check and she was going to do the background check and criminal check. I just didn’t know if a credit check and a credit report were the samething . Yes they are. And the good thing when you check your own credit reports it doesn’t hurt your credit scores because the inquiry will be a soft inquiry. If a landlord says they are only doing a rental history check. What do they do to perform that? Hi. I have had problems with a credit card and my account was closed, that was 5 years ago. Every penny was paid and didn’t have problems again. All my bills get paid on monthly basis and My rent has always been paid on time, will I get a bad credit report? I’m trying to rent a place and have references from previous landlords. If you have other credit (car loan, credit card, etc.) and have paid on time that will help. Rent is most often not reported. But why not check your credit to see? You can get a free credit report summary from Credit.com. You can also check your free annual credit reports from each of the three credit reporting bureau. Scores come from information in your credit reports, so it’s important to be sure the information there is accurate. (If it is not, you can dispute it so inaccuracies can be removed.) Checking your credit will not hurt your scores — and in many cases, worried consumers discover their scores are higher than they thought. Good luck to you! I Paid for a Landlord Credit Check. Don’t I Get to See It? When am a student 5 years ago I rent a place, I moved out of the place without completing the lease and I owed the apartment complex for my last month there but now I have been trying to pay what I owed the apartment complex back but how long will I have to wait to be able to rent a new place again? Each landlord has its own policy. If you are upfront about what happened and perhaps are willing to put up a larger deposit next time, perhaps one will work with you. Why do my landlord need to know if I own aa mortgage before she let me rent an apartment from her.OK I do own a house but its currently in a separation battle.I had to tell her my name was on the mortgage and what the payoff was..Why?? Legally your mortgage is your financial obligation so she may want to make sure you are able to handle both payments if it comes to that. With regards to background checks, does having a cosigner provide any benefit to the renter? A co-signer helps with credit. Are you referring to credit checks? from Credit.com. It updates monthly and includes personalized advice on improving your score. When I try to get my credit reports, it always comes up “we’re sorry, we are unabe to verify your identity- It did come up once on experian, I have 2 very old small collections, and and old bill, is this a lack of credit? What can I do? You may want to contact the bureau that is not able to provide the report to find out why you are getting that particular error message. Just another way to keep people indebted and to have to use credit to find decent housing. Strikedebt.org explains this. End this unjust cycle.